Today’s business environment demands high-performance and high-quality products at a competitive price. AMROTEC® provides just that at the most competitive rates in the industry since 2003. AMROTEC® produces and offer quality and impressive Coin and currency Discriminating and Sorting Equipment designed to handle medium to heavy-duty volume requirements at financial institutions, medium to large retail chains, credit-unions, community banks, casinos and other gaming and vending operations. 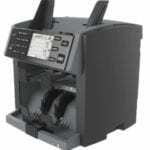 Various models to choose from depending on your budget and need. AMROTEC® Equipment are Certified …..
Our coin & cash handling products are Certified by various certified agencies, such as FCC and CE tested labs and manufactured under highest quality standard and quality-control. Our certified Currency Discriminators not only offer advanced functionality and user-friendly operation at the front teller or back office operation at financial institutions, casinos, gaming industry and retail environment, they have been proven in the market place for years. *AMROTEC® is a USA federally registered trademark since 2003 under AMRO-ASIAN TRADE, INC. Released 2003 - Discontinued 2014. AMROTEC's flag-ship model and product since 2003 - 2014 and was sold to thousands of financials and super-market chains. First ever Korean made currency discriminator in USA market which satisfied growing need for a heavy-duty model with one Stacker and a dedicated full reject pocket allowing non-interrupted functionality at an affordable price. Medium-duty Gravity Rail Sorter model S-200 was first released in 2004 and obtained UL, FCC approval in order to sell to financial institutions under world-known ATM manufacturing company located in the USA. Re-launched in 2016 with upper coin tray, new software-interface and batching capability according to Federal Reserve guideline for full-bags, particularly 10,000 coins for 10c. S-200 still remains as one of the high-quality gravity rail sorter with 700 speed and foreign coin rejection capability in the market. First released in 2004, S-500 is a belt-driven Medium-Heavy duty Coin Sorter obtained UL, FCC approval n order to sell to financial institutions under world-known ATM manufacturing company located in the USA. Re-launched in 2016 with advanced sensor technology, new software-interface and batching capability according to Federal Reserve guideline for full-bags, particularly 10,000 coins for 10c. S-500 still remains a cost-cost high-speed (2000 coins per min) coin sorter for medium-heavy coin processing operation. 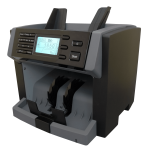 Advanced Currency Discriminator model SB-1100 was released in 2006 with super-counterfeit bill detection capability and discontinued in 2014. SB-1800 Fitness model was released in 2008 and discontinued after a year. Released in end of 2013, X-1 is one of the world’s most compact currency discriminators with a 50 bills dedicated half reject pocket. It is equipped with Smart & most comprehensive symbolic user-friendly functions, 3.5" large color display for medium-duty front bank tellers and small-mid retail cashiers. It provides various operational modes (MIX, SINGLE, SORT, FACE, ORIENT, CNT). X-1 not only provides users trouble-free operation, but also allows uninterrupted counting with increase productivity that all customers desire. X-1 also reduces operation noise by 10dB than competitors making it to be the quietest machine in the market since 2013! Released in end of 2014, X-1000 is designed for large volume cash processing up to 72,000 bills per hour error-free while optimizing cash processing efficiency at large financial institutions, casinos and super-markets. 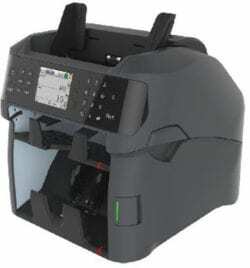 Featuring Dual-Sensors image processing technology, it provides various counting and sorting modes (MIX, SINGLE, SORT, FACE, ORIENT, CNT) of operation uninterrupted with a dedicated full reject pocket while at the same time, provides superb suspect detection. Since it’s released in 2014, X-1000 gained popularity for it’s heavy-duty structure, low bill jam rate, precise and accurate authentication. X-1100 provides same functionality as X-1000 except X-1100 is equipped with FITNESS detection mechanism to provide fitness functionality according to Federal Reserve Bank fitness sorting guideline. Best heavy-duty 2 pockets currency discriminator in USA market today! 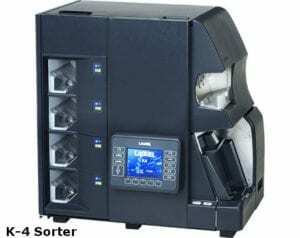 Released in end of 2014, AMROTEC® XCount+ is an advanced, up-to-date and high-speed Single stacker Currency Discriminating Counter with capability of banknote recognition, value counting and suspect detection functions. It is designed for low to medium volume tellers and retail cashiers to process their daily task – a potential replacement of High-cost brand name Piece Counters in the market place today. 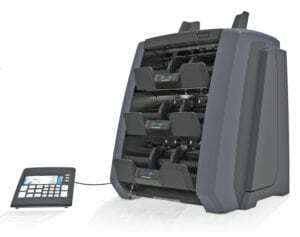 Our XCount+ model is equipped with various modes of counting operation, such as MIX, SORT, SINGLE, FACE, ORIENTATION. It is constructed with compact and easy bill path access for jam removal and daily maintenance. Further, XCount+ includes a unique hand-held design with flexibility of movement from one location to another location. Released in 2016, AMROTEC® X-3000 having 3 stacker pockets, the latest and most advanced and the fastest sorter in the group, featuring enhanced and reliable bill recognition, authentication & banknote and ticket sorting ability. Built with wide-range of counterfeit detection capabilities, X-3000 stops counterfeits by using the most advanced counterfeit detection technology in the industry. Three-pocket design assists user to process mixture of barcoded tickets with banknotes in one-single-pass. Supporting most of the currencies worldwide, and various possibilities for connectivity (CPS-CASINO only), X-3000 is able to satisfy the growing demand for more efficient cash and Ticket management. 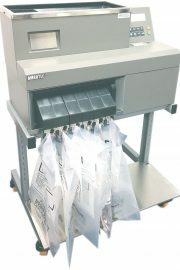 Released in 2016, AMROTEC® offers heavy-duty K-Series Currency Sorters to process banknotes and Casino tickets ranges from 4 Stackers WITH ONE DEDICATED REJECT POCKET (K4 MODEL). K4 model is designed for Financial, CIT and Casino Industry for it's heavy-duty construction and high-performance capability. 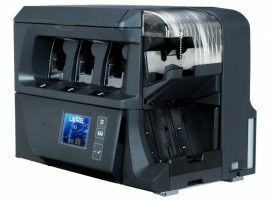 Manufactured in Japan by world reputable bank equipment manufacturer Laurel, K-4 is equipped with various counting and sorting configuration capability to count, sort and authenticate US currencies as well as Casino bar-coded tickets. 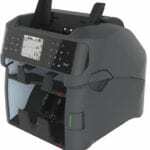 K-4 Model is interfaced with CASHPRO software to receive currency count and ticket decoding info in ONE-PASS. Best suitable to use with a larger banknote sorters in high volume operation or in alone for smaller casinos and bank back office. 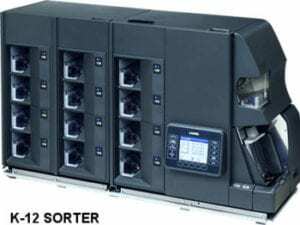 Both K8 and K-12 Large Banknote Sorters are released in early 2017. These models are heavy-duty, high-performance and can handle large volume cash and Casino tickets ranges from 8 Stackers WITH ONE DEDICATED REJECT POCKET (K8) or 12 Stackers with one dedicated reject pocket (K12). Both models are designed for back office operation at Financial, CIT and Casino Industry for it's heavy-duty construction and high-performance capability. 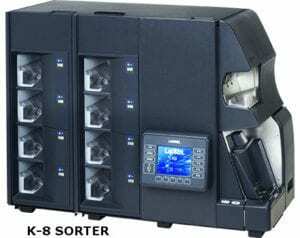 Manufactured in Japan by world reputable bank equipment manufacturer Laurel, both K-8 and K12 are equipped with various counting and sorting configuration capability to count, sort and authenticate US currencies as well as Casino bar-coded tickets. K-4 Model is interfaced with CASHPRO software to receive currency count and ticket decoding info in ONE-PASS.